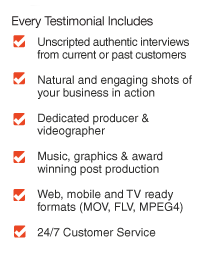 Video testimonials are the most powerful way to build trust and credibility. By using existing customers to communicate real experiences, video testimonials are perceived as genuine, believable and more authentic than their written counterparts. Video testimonials are widely used throughout the sales cycle to raise awareness, generate interest, instill confidence and convert visitors into customers.